We learn not for school, but for life. Help tend the HB Community Garden this summer. 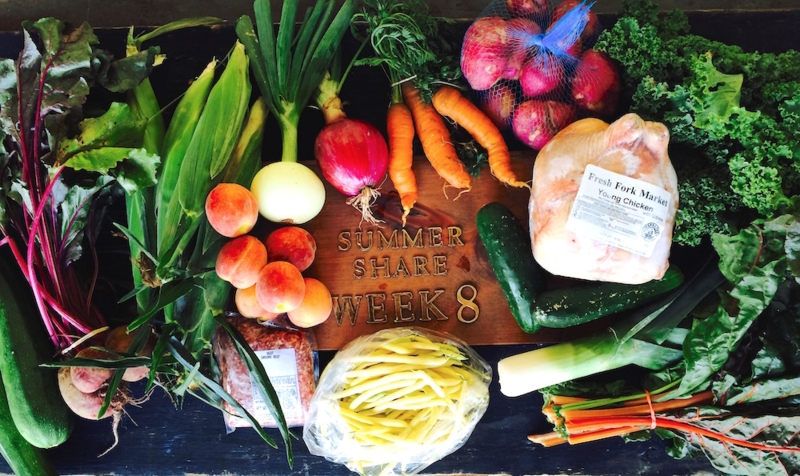 Sign up for a share with Fresh Fork Market and pick up your weekly bag of local food at HB! 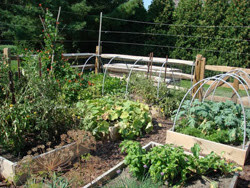 1) We need your help caring for the HB Community Garden over summer vacation. Summer garden volunteers do light weeding, watering as needed, and other small tasks. We use a home-made, non-toxic weed control method on our pathway and around the fenceline. This will involve spraying a vinegar-dishsoap-clove oil mixture 2x/week on the brick pathway and around the fenceline. In return, volunteers take home ready-to-harvest crops. There isn't usually much to harvest in June beyond the perennial herbs, so June caretakers will get the excitement of tending the emerging seedlings, but won't get to take much, if anything, home (You could consider signing up for a week in June and a week in August to see both the early and later season garden!). No experience necessary; if you sign up, you'll get a reminder email and instructions a few days before your week starts. Sign up here for a week of garden care. Contact Director of the HB Center for Sustainability Torrey McMillan '90 with questions at tmcmillan@hb.edu. 2) Fresh Fork Market will have a pick-up point at HB starting Friday, June 2nd and running until Friday, October 27th. They will be setting up shop from 4:00-7:00pm in the Prime parking lot! Fresh Fork Market is a weekly subscription service to locally grown and sustainably-produced foods. Some call it a Farm Buying Club — similar to a CSA program (Community Supported Agriculture.) By working with more than 100 family farms all within 75 miles of Cleveland, Fresh Fork offers members a weekly selection of what’s just been harvested: fresh produce, whole grains, farm-fresh eggs, grass-fed dairy products, pasture-raised meats and much more. Members meet one of Fresh Fork's refrigerated trucks (20+ different pick up locations all over town) and get their “share” bag. Each week’s bag contents are different based on what’s just been harvested, and they offer vegan, vegetarian and omnivore subscriptions. The season starts out green (lots of leafy vegetables), gets colorful (tomatoes, peppers, corn, berries), and ends down-right back breaking (cabbage, squash, melons)!